Today, Memphis International Raceway (MIR) announced that Allen Johnson, the 2012 National Hot Rod Association Mello Yello Pro Stock Champion, and The H.N. and Frances C. Berger Foundation will bring the teen safe driving program B.R.A.K.E.S. to the raceway for the first time ever in conjunction with the World Series of Drag Racing presented by Sunoco and the Memphis Convention and Visitors Bureau on Aug. 27 and 28. B.R.A.K.E.S., which stands for Be Responsible and Keep Everyone Safe, is an organization founded by fellow drag racing champion Doug Herbert in 2008, following the tragic highway accident that claimed the lives of his young sons, Jon and James. The nationally acclaimed teen proactive driving school teaches advanced behind-the-wheel defensive driving and accident avoidance in KIA-provided vehicles. 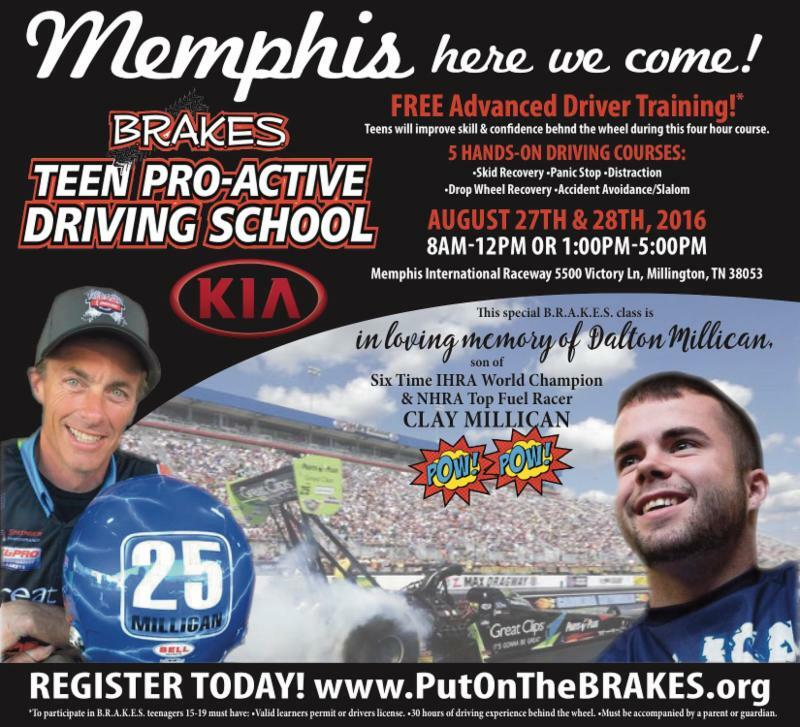 Classes will be held from 8 a.m. to noon and 1 to 5 p.m. on Saturday, Aug. 27 and Sunday, Aug. 28 at Memphis International Raceway, 5500 Victory Lane in Millington. "We are thrilled about this special addition to the momentous first World Series of Drag Racing presented by Sunoco and the Memphis Convention and Visitors Bureau weekend right here in Memphis," said Pam Kendrick, vice president and general manager of MIR. "This event also has a close connection to one of our local drivers, so it's extra special to host the event this year." The event is being held in memory of Dalton Millican, a Monster Jam driver and the late son of local Drummonds, Tennessee, native Clay Millican, who is a six-time International Hot Rod Association World Champion and NHRA Top Fuel racer. Millican and his wife, Donna, lost Dalton in a single-person motorcycle accident in August 2015. "Clay Millican has been one my fiercest rivals on the drag strip, and he has also been one of my best friends off the track," Herbert said. "After Clay and Donna lost Dalton last year, several people wanted to do something to honor Dalton's legacy, and we had some great friends step up and help make it happen. I am so happy and grateful that we are able to bring B.R.A.K.E.S. to Memphis this year." NHRA Pro Stock Champion Allen Johnson, driver of the Marathon Oil Dodge Avenger, believes the B.R.A.K.E.S. events can help kids remain focused while driving and teach them car control skills to help them avoid having an accident when the unexpected happens. "Doug's organization is just incredible, and Clay and Donna Millican are incredible people, so I am just happy that I am able to be part of this meaningful opportunity to honor their son Dalton," Johnson said. "Teaching our teenagers how to be safer, more mature drivers is so important these days with so many distractions like cell phones and loud stereos stealing their attention." The H.N. and Frances C. Berger Foundation has supported the B.R.A.K.E.S. program for several years in an effort to help teach young drivers the skill they need to be safe on the roads. "I was sitting next to Clay and Donna Millican at last year's B.R.A.K.E.S. Gala, and I was trying to think of a way that I could do something to support them," said a representative from the H.N. and Frances C. Berger Foundation. "When Allen Johnson stood up and challenged someone to match his donation in effort to bring B.R.A.K.E.S. to Memphis for Clay and Donna, I didn't hesitate to raise my hand." For the Millican family, bringing this event to their home track at Memphis International Raceway during the World Series of Drag Racing presented by Sunoco and the Memphis Convention and Visitors Bureau weekend in honor of their son is a blessing. "My family has been truly blessed to have had Doug Herbert as a friend through all of this," Millican said. "The things he has done with the B.R.A.K.E.S. organization is something that is very special and cannot ever be measured. Thanks to what these teens learn at a B.R.A.K.E.S. class, there are a number of families who will never get that phone call or have that knock on the door to tell them they have lost a child. How can we all not be grateful for that?" B.R.A.K.E.S. classes are free but require a $99 refundable deposit to reserve a spot. For more information on the teen proactive driving school's eligibility guidelines and to register (teenagers and their parents are required to sign up), please visit www.putonthebrakes.org. B.R.A.K.E.S. is a nonprofit 501(c)(3) organization. The World Series of Drag Racing, the world's longest continually running drag racing event, will celebrate its 63rd year at the Mid-South's premiere motorsports destination, Memphis International Raceway, Aug. 26 to 27 with support from Sunoco and the Memphis Convention and Visitors Bureau.